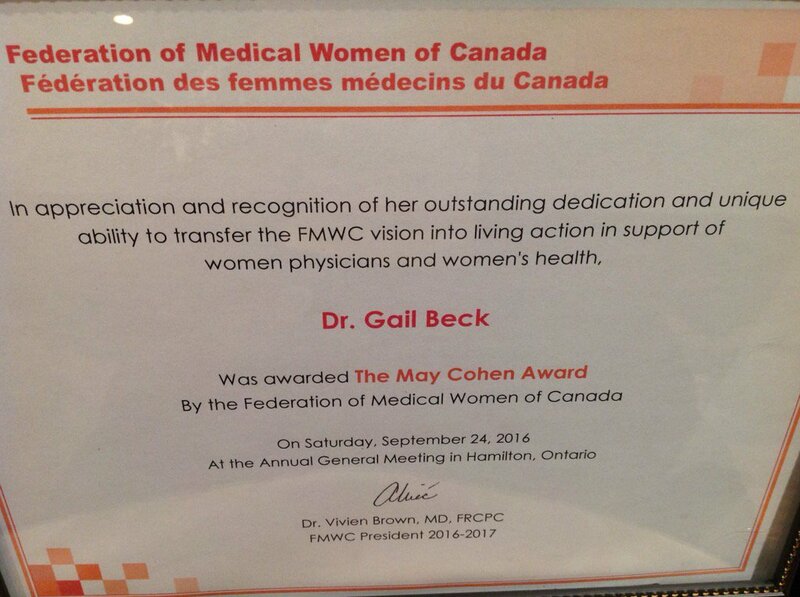 This past weekend, I received the May Cohen Award from the Federation of Medical Women of Canada. I have known Dr. May Cohen for almost 20 years. She was the co-founder of the first centre for women’s health in Canada at McMaster University. The Federation gives this award every year to the member who transfers “the FMWC Vision into living action in support of women physicians and women’s health.” Like many of the women before me who’ve received this award, knowing May makes the award feel very personal. She can tell you personally – and likely would – if you didn’t measure up to the standard she sets by her own actions. The Federation of Medical Women of Canada (FMWC) is the one medical organization I belong to that never loses sight of the ongoing restrictions to health care that women still face because of gender bias. This was evident when May was a medical student in 1955. It was still the case when I was a medical student twenty years later and it continues to be the case today. Medicine is beginning to more conscious of the needs of women patients, but the annual meeting of the FMWC is always a reminder that there are still circumstances when medicine and doctors fail women. Being a member of the FMWC ensures that I stay current with the controversies affecting women’s health care. Also, the FMWC’s parent organization, Medical Women’s International Association, allows me to be involved in women’s health at a global level. On Walnut Street, between King Street and Main Street in Hamilton, from 1932 until 1966, Dr. Elizabeth Bagshaw ran the first birth control clinic in Canada. If you go there, you can find the plaque in honour of her pioneering work around the parkade and Dollarama on Walnut Street. More important to the Federation, Dr. Bagshaw is one of the Founders of this organization, and her work represents for me the essence of the Federation of Medical Women of Canada. Women physicians through this organization have worked to ensure that women in Canada, and especially women in marginalized populations, have access to the safest and best health care for themselves and for their families. We have done this even when it is controversial. Family Planning (Code for birth control) was certainly controversial in Dr. Bagshaw’s time. As we confront the barriers to the prescription of the mifepristone/misoprostol combination for medical abortion, the Federation faces that family planning continues to be controversial. But the FMWC has always supported women having control over their own reproductive system. When the birth control pill was introduced, this Federation worked to ensure its broadest access. We still have to do that – all physicians do. Gender-based violence is a scourge on women’s health and we have always championed the prevention and elimination of gender-based violence. This year Medical Women’s International Association will publish a new manual on gender-based violence for use around the world. The Federation of Medical Women of Canada alone among medical organizations in Canada worked to ensure funding for the vaccination against Human Papilloma Virus. We continue to lobby so that more and more young people can be vaccinated – a proven preventative measure that is, sadly, controversial. We have worked for the most vulnerable women in Canadian Society and, through Medical Women’s International Association, around the world. Dr. May Cohen’s personal work as a physician advanced the FMWC’s fundamental mission and I am truly honoured to receive the award named in her honour. I want to thank May for the inspiration that she is. I want to thank Dr. Shelley Ross, my mentor, for nominating me for this award. It means a lot to know that she believes I deserve this. For the same reason, I want to thank the Federation of Medical Women of Canada for allowing me to stand among these remarkable women doctors who have changed women’s health in Canada.